Lindenwood pitcher Austin Georgen pitches in a game last season. Coach Doug Bletcher said that pitching will be key to the Lions' success this year. 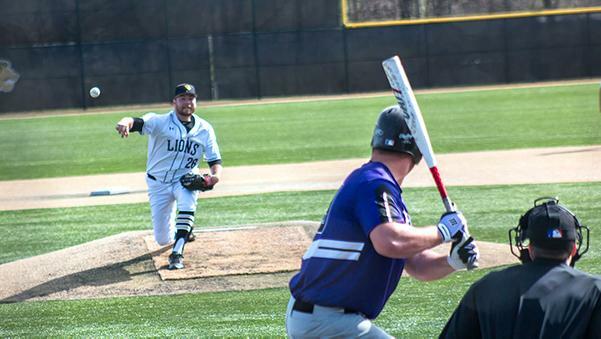 The Lindenwood University baseball team hopes to get things off to a good start when it plays its season opener on Feb. 2, against Lee University in Cleveland, Tennessee. Last season, the Lions were 26-24, going 16-20 in conference play. Lee University had a similar record at 27-26, going 16-13 in the conference. Lindenwood Coach Doug Bletcher said one area the team will be focusing on this season will be pitching. “Pitching is key this year as well as taking care of the pitchers and tying everything up,” he said. To help with that effort, Bletcher has brought back former player and alum Zac Pearman, who helped coach during the 2017 World Series run for Lindenwood, as the associate head and pitching coach. In his four years as a Lindenwood starting pitcher, Pearman had a career 4.95 ERA, with a 28-14 record, with three shoutouts and 152 strikeouts. A shoulder injury in his junior year hampered his record, although he got six wins his last two seasons. The team also will rely heavily on senior catcher Ryan Sosnowski and junior Dominic Rivetta, who plays multiple positions, including first and third bases and is a designated hitter. Also returning is sophomore pitcher Tyler Cassmeyer, who was recently name preseason all-region pitcher by the National Collegiate Baseball Writers Association. Last year he went 7-3 with a 3.01 ERA and 79 strikeouts. In addition, Bletcher said some new players this year will help improve the team chemistry, including: Mitchell Krebs, a junior transfer who is an all-around infielder; Bryce Beckmann, another junior transfer who plays all of the outfield positions; Calvin Nowak, a freshman out of Waukesha, Wisconsin, who also plays all the outfield positions; and Kolby Schulte, a sophomore who plays in the infield. Bletcher said that as the year goes on and the team plays more and more, its chemistry will grow and they will play better as a team. Our “best game will hopefully be the last game of the season,” he said. This is the team’s last year in the Mid-America Intercollegiate Athletics Association because Lindenwood is moving to the Great Lakes Valley Conference. Bletcher said he hopes to leave a lasting impression on their opponents. “I want to be feared by some but respected by all,” he said. Editor’s note: the language in this article has been updated to be more accurate in regard to Zac Pearlman’s experience.